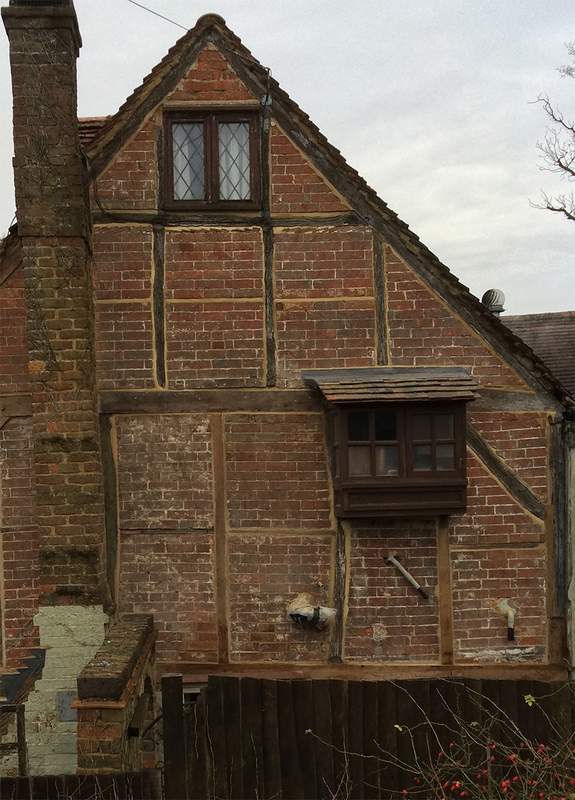 Case study about an 11th century timber frame building gable repair carried out in Capel, Surrey. Our challenge was to repair the gable of this 2 bay 17c cottage in Capel. It was letting water in, staining the plaster on the inside and becoming unsightly due to patches of decay and many previous "temporary" repairs. We suspected that the cementitious render applied to the face of the brick panel infill and partially covering some of the timbers applied with the intention of keeping the water out, was in fact trapping moisture in the wall and decaying the timbers. On removing the render we found that many of the timbers were seriously decayed, as you can see in the before image and some of the timbers were in danger of structural failure. During the repairs we found many dangers including evidence of what we believe is the House Long Horn beetle (hylotrupes bajalus). This beetle is quite rare in the UK, being found in north Surrey, south west London, north Kent, south Essex and Hampshire. We also found evidence of wood boring beetle found, including the Furniture beetle or common woodworm (anobium punctatum). The cementitious mortar has been completely removed as you can see from the after image, this revealed very nice quarter bond brickwork with "penny struck" joints. We renewed the lead flashing above the oriel window and added new step lead flashing to the shoulders of the chimney. The margins to the brick panels were re-pointed in lime mortar and broken bricks replaced or repaired. No attempt has been made to disguise the repairs made. They become part of the building's history. Nor is there any attempt to make the building look new, but to use sympathetic techniques and materials to ensure structural integrity and performance.